Make sure teeth stay straight with your retainer! If you’ve had orthodontic treatment then you know how much work went into creating that straight, perfect smile. Also, you may be among the majority of former orthodontic patients who have at some point lost, or simply neglected to wear, your retainer. Wearing a retainer is vital to keeping your perfect alignment because otherwise (no matter how many years of braces you’ve had in the past) your teeth will shift due to uneven pressures exerted in the mouth. At Jackson Square Dentistry we will create a brand new, custom-fitted retainer for you at the conclusion for your treatment, and we are of course happy to measure and fit you for a replacement retainer. Just think, you’ve already made the sacrifice of wearing braces to straighten your teeth, so why throw those years of treatment away by letting your teeth slowly shift? 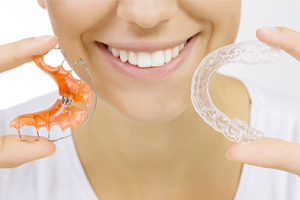 Make sure that your smile remains perfect with a retainer! Jackson Square Dentistry is proud to offer Vivera® Retainers, custom-made, precise fitting and 30% stronger than traditional orthodontic retainers. Vivera® Retainers are also made by the makers of Invisalign®. For new retainers or other orthodontic consultations with Dr. Jeffrey Katz, please contact Jackson Square Dentistry today!